My thoughts about Cars of the People season two. 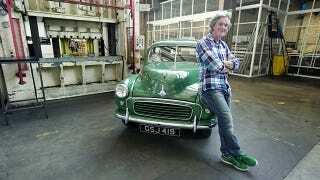 James May is back with another season of Cars of the People, and the first episode is mostly good. He tries to show how the Japanese and Germans pulled the rug out from under the Americans and British, but a lot of the material is stale. May pulls out some iconic cars and praises or poops on them, and while the info he gives is generally interesting and correct - the path is mostly well beaten. He’s not going anywhere new, nor is he seeming to even try and put an individualistic twist on history. The one nearly daring thing he does is criticize the Morris Minor, and this he does fairly lightly. After that he picks easy, obvious targets that have been beaten to death before. And that’s where most of my criticism comes in. One thing is, he tries to cover so much ground in one episode, there really isn’t any space to get into the more thought provoking aspects of the history he’s touching on. He brings out a Mustang II to prove a point about the U.S. auto industry losing its way. And while the Mustang II is a nice symbol for much of what was wrong with the industry in the 1970s - it sidesteps a much more interesting and revealing question; Why did Chevrolet and Ford do so well in the 1960s when they brought out the Chevy II and the Falcon - but fail so miserably when they tried to repeat that success with the Vega and the Pinto? There are a multitude of reasons, which say a lot about Ford and Chevrolet, as well as the way the market and the competition had changed - unfortunately none of which are as entertaining as saying (basically) “Ford decided to make the Mustang ugly and stupid, and surprise it didn’t sell! - what a piece of crap!”. Similarly, May trots out a nice Morris Minor, then tells us that while it was great, certain aspects of it were half-assed. Like how Morris stuck an outdated engine in an otherwise all-new car, because that’s what they were already making. It would have been neat to hear James’ thoughts about why a huge company like Morris thought they couldn’t afford to design the flat four engine Issigonis had wanted for the Minor, but a tiny company like Jowett was able to make one for their Javelin. But he doesn’t go there. Or why Triumph had attempted to produce a competitive front wheel drive car, and then gave up - while everybody else around the globe managed to bring one out. Instead he just points out that Triumph lacked German quality control. It might also have been nice to hear why the British motor industry gave so little effort into selling cars in the U.S., the largest market in the world. Did they really think they could depend on exports to the colonies forever? Or did they just think the (non-sporting, mass-) market was too hard to crack? Compared to Japanese and German (and even French) attempts, British attempts were pretty feeble in this crucial market. The Minor for instance, could have been much more appealing to Americans than the VW beetle - had it been marketed and supported with anything approaching the same thoroughness as provided by VW. Those would have been interesting travels down paths less well beaten, and revealed answers more insightful than just “unions were bad and management was bad, and companies were complacent”. Or at least provided fresher perspective on those problems. The first series is interesting because May occasionally gives an answer that hasn’t been heard a million times before - hopefully the second series will give us a little more of that in the next episodes. A much smaller issue is May also glosses over a whole period of postwar BMW history, stating that after the war BMW decided to focus on upscale models, which would yield high profit margins. True. But, he forgets to mention that this move proved premature and nearly killed the company, and that BMW had to resort to a string of super-cheap entry level segment cars during the 1950s to keep themselves afloat. A reality which doesn’t quite fit the narrative of the rest of the show. It is interesting to see May in action, on his own, doing a subject he is interested in. But if you’re a real car enthusiast, you might be disappointed to see May looking for the most superficial answers to questions that have already been asked thousands of times. Although the episode manages to be entertaining from beginning to end, it also feels like May is just going through the motions.